Renowned for its scenic appeal and stunning sunset views Koh Samui's West Coast is a dream tropical island destination. 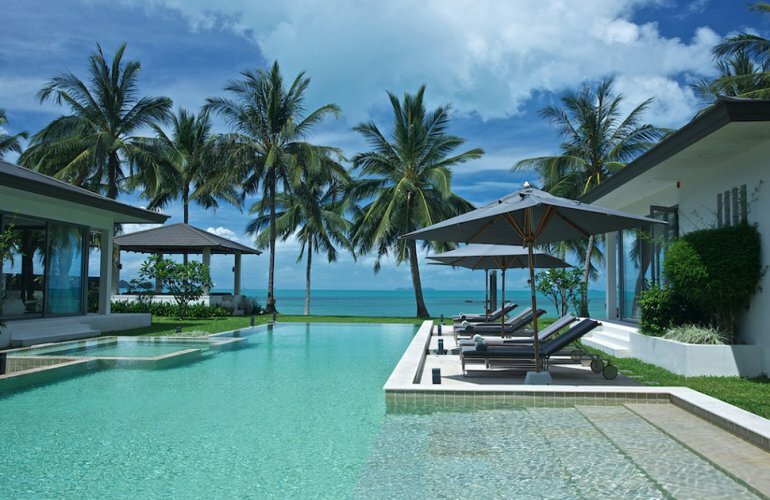 This magnificent ultra-modern villa enjoys an exclusive location on Taling Ngam's pearly-white sands; it offers sumptuous beachfront living for up to 14 guests, a wealth of space and style and privacy for your perfect holiday. Designed to capture spectacular views of the azure ocean and lush surroundings this walled and gated villa is a true tropical treat. The enormous home consists of five imposing pavilions designed around an impressive sun terrace, immaculate lawn and superb infinity-edge pool. The 20-metre pool spills over into a children’s pool at the far end and features a large Jacuzzi. Manicured lawns extend around the pool and sun deck with luxury sun loungers and parasols placed around the pool’s perimeter. Gardens and pathways extend around the villa and down to a furnished beachfront sala located at the water’s edge enjoying spectacular views over the coast and Five Islands beyond. Four sumptuous bedroom suites are located on either side of the swimming pool each featuring spacious sleeping accommodation, king size beds, and furnished living areas with sofas, wooden floors, private sun deck and loungers. These en-suite bedroom pavilions also feature built-in wardrobes, security safes, mini bars, dressing rooms and large wall-mounted LCD TV’s with DVD/CD players. The impressive en-suite bathrooms boast twin basins, walk-in rain showers and sunken terrazzo tubs. Two of the bedroom pavilions include children’s bedrooms equipped with bunk beds and en-suite shower rooms. The grand living pavilion is located to the rear of the pool commanding lofty views over the entire property and beach beyond. This remarkable dwelling features a spacious open-plan living room, a stylish dining area and state-of-the-art kitchen as well as a spectacular floating staircase leading up to a mezzanine floor with air conditioned gym, office, library and further stairs up to the master bedroom. The vast open-plan living room features a striking vaulted ceiling, dramatic charcoal terrazzo floors, an array of designer furnishings and fold-away glass doors with breath-taking views out to the ocean. An elegant dining table for 14 guests is served by the contemporary kitchen with modern units, up-to-the-minute equipment and an adjacent Thai kitchen with lava-stone grill and a private herb garden for professional staff catering. A separate air-conditioned lounge is located to the rear of the living room equipped with luxury furnishings, an ornamental chess table, huge LCD TV/DVD and high-tech Bose sound system. Nearby is an elegant guest bathroom plus the grand entrance hallway accessorised with traditional Thai ornaments and fixtures. The first floor mezzanine is home to a glass-fronted gymnasium with adjacent shower room and a walkway leading to a private office and fully-stocked library. The villa’s third floor features a grand master bedroom which extends over the entire floor featuring a king size bed, dressing room, private lounge, fitted kitchen and stunning en-suite bathroom with large tub, double rain shower and twin basins. The vast suite opens out onto an impressive balcony with outstanding sea views. This state-of-the-art holiday retreat features a whole host of luxury fixtures and modern conveniences including specialised mood lighting, high-tech sound system with speakers in numerous spots around the property, large LCD TV/DVD in all bedrooms and complimentary WIFI internet access. This safe and secure home features a CCTV security system, a night security guard and staff including a villa manager, a Thai chef and a maid.